Teaching artist Catlin Cobb keeping the beat going for her students. In the spirit of National Young Audiences Arts for Learning Week (YA Week), I visited the Martin Luther King Jr. Elementary School, P.S. 11, in Jersey City this past Wednesday. I attended the Dodge Dance Initiative (DDI), one of the Young Audiences New Jersey & Eastern Pennsylvania workshops. 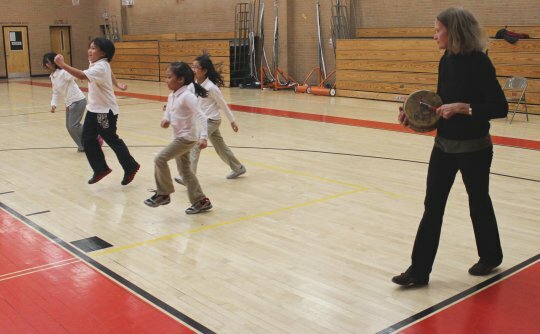 The DDI is a two hour after-school program where students in grades 3-5 worked with a teaching artist that integrated dance into the kids PE class. The students showing off their “Group Sculpture”! One really intriguing concept was how Ms. Cobb would say the word “shape” instead of “freeze” or “stop.” This constantly reminded the kids to perceive their bodies as the medium for their dance - transformable into any form or pose. Watching the students dance across the gym and periodically freeze into their dance movement was fun and inspiring. It was very impressive to see kids so young collaborating and expressing themselves through dance movements. I would like to thank the P.S. 11 staff, Ms. Cobb, and the YA New Jersey & East Pennsylvania staff for this wonderful opportunity to visit and observe their workshop. Learn more about the National Young Audiences Week and the Dodge Dance Initiative. During the free style movement exercise, the students rolled, jumped, and crawled across the gym.